East of the central Station lies Zeeburg. It comprises the Indische Buurt (lit: Indian neighbourhood; Indonesia was called Dutch India in its colonial days and the streets here are named after Indonesian islands) with its four-storey apartment blocks that were built around 1900 but renovated in the 1980s. 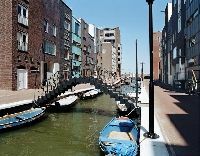 The Oostelijke Haven Gebied (OHG) comprises both 1930 architecture and modern 6-room condominiums finished in 2004. Currently, the first inhabitants are moving into their houses in IJburg, a new sub-district of Amsterdam with housing for different income groups. It is still in full development and recreational options are not all available yet. There will be sports facilities and a library and that, it would seem, is going to be it. Parking facilities in IJburg will be mostly underground, to allow extra space for greenery and play areas for children. The Indische Buurt is a multicultural district, with all the good things (exotic food and shops) and bad things (houses covered in satellite dishes, cultural frictions) that go with it. The crime rates are relatively low. As anywhere in Amsterdam, parking can be a problem and as elsewhere in the city bicycles are more important than cars. Zeeburg sports the shopping streets of the Javastraat and Sumatrastraat with their multicultural appeal, nice restaurants and, last but not least, Amsterdams city beach: Blijburg. A typical apartment in the Indische Buurt costs between 400 and 500. In IJburg social housing (the only rentals that will be available) will cost up to 541.